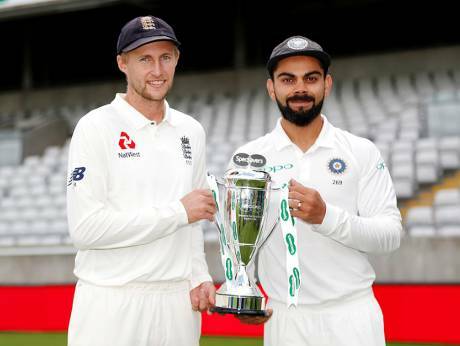 Birmingham: India will aim for a bright start to the gruelling and testing five-match Test series against hosts England when the first match begins at the Edgbaston Cricket Ground here on Wednesday. Kuldeep impressed everyone in the recently-concluded limited overs game against the hosts but playing a five-day game will be a completely different scenario and the skipper might be tempted to include him in the playing XI. Meanwhile, the keeping gloves is likely to be handed to Dinesh Karthik ahead of young Rishabh Pant as the former carries more experience than the Delhi stumper. India also have a couple of crucial calls to make in the batting department. The form and performance of top- order batsmen Shikhar Dhawan and Cheteshwar Pujara has been a worry, even as voices have been growing for Lokesh Rahul's selection to open the batting with Murali Vijay. Dhawan struggled in the T2OI series before making scores of 40, 36, 44 in the ODIs. While he made a pair of ducks in the warm-up game against Essex ahead of the Tests to help his critics, Rahul made 58 in the middle order and 36 not out when given the chance to open in the second innings. Pujara posted scores of 1 and 23 against Essex. Vijay, Kohli and vice-captain Ajinkya Rahane are proven performers in the overseas conditions and India will rely on them to put big scores. There has been a lot of controversy around leg-spinner Adil Rashid's comeback into Test after quitting the longest format two years ago. He has been picked for the first Test after an impressive ODI series outing. Stokes will give the balance to the English team with his batting and bowling and will be eager to prove his value in the series.